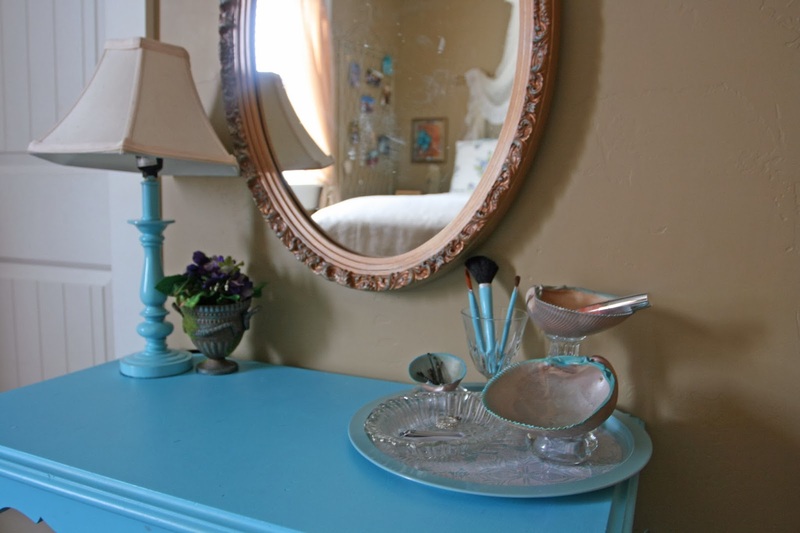 Adventures of a BusyBee: Vintage Aqua Princess Bedroom for my Teenage daughter…done on a budget! 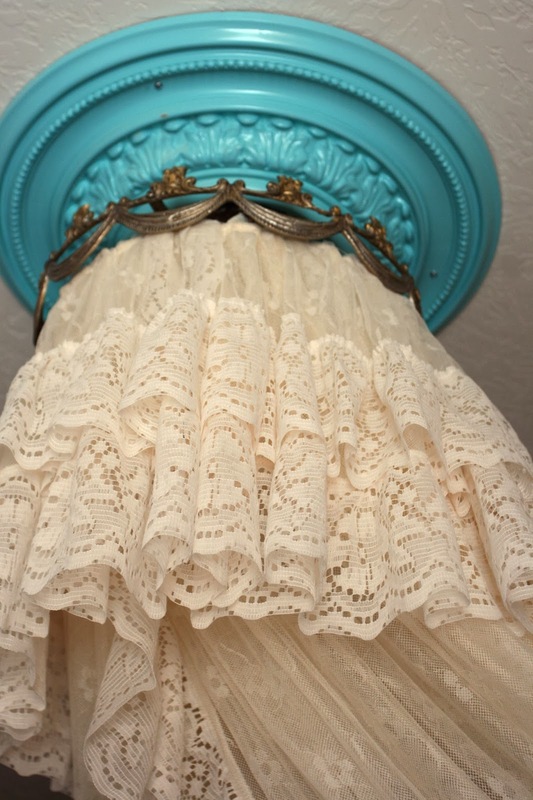 Vintage Aqua Princess Bedroom for my Teenage daughter…done on a budget! For the past several months, I have been planning to re-do my daughter's bedroom as a surprise for her 16th birthday. I missed getting it done in time for that, but finished up a week later, just in time for her to see it on Valentine's Day! 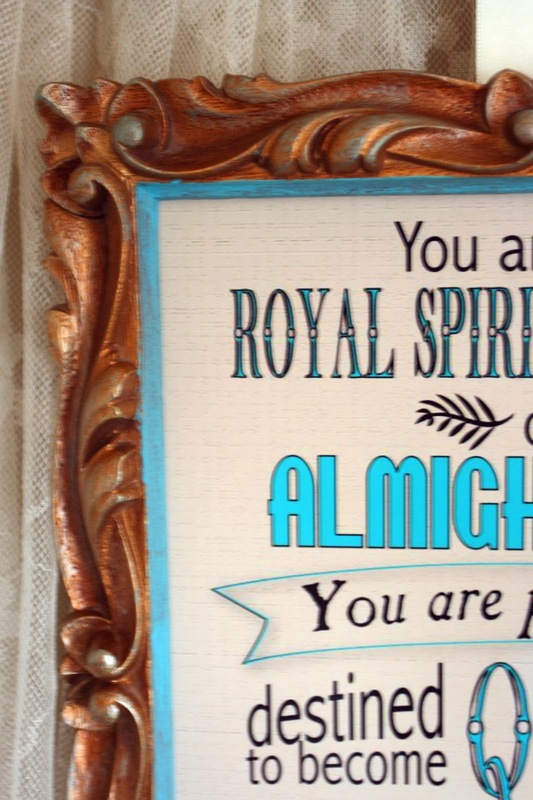 I have recently redone my step-daughters room as well, in a similar color scheme of aqua (though her accent colors are lime green, white and black)…so I've had aqua on the brain! I do think it might be my new favorite color! The whole bed zone, including the 2 nightstands. The side view of the room. I found the curtains on clearance at Walmart the week I did the room, and they were the PERFECT champagne gold color…that was a lucky find for sure! The centerpiece of the room. And I couldn't be happier with it! 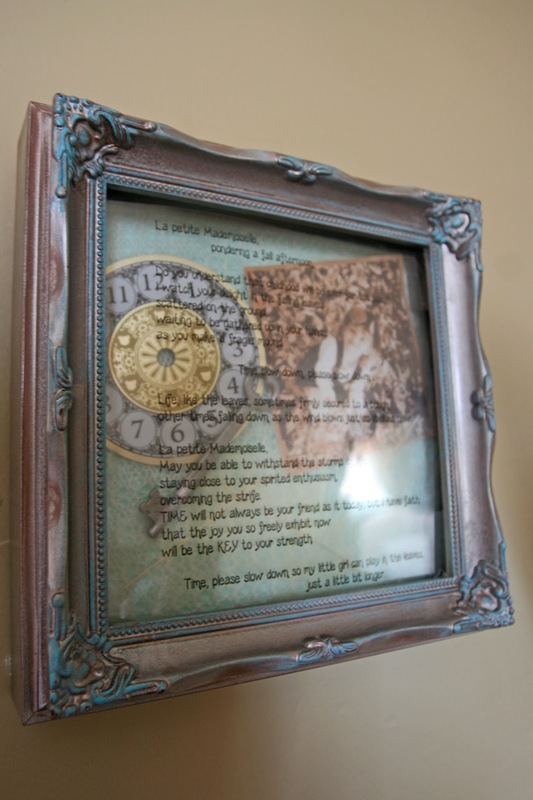 I had all three elements hanging around from previous thrifting trips over a number of years. 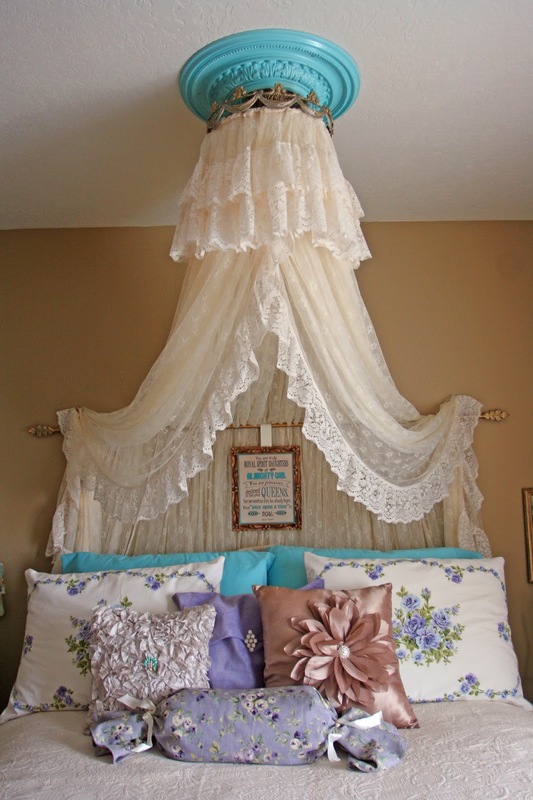 I got the idea for hanging the lace canopy when I saw a picture from a castle when I was looking online for ways to hang canopies. That's when I remembered that I had a vintage light fixture that I had found years before…and I already had a ceiling medallion as well! My dad helped me hang the whole thing after I stitched the canopy onto the ring inside the light. It's wonderful, isn't it? 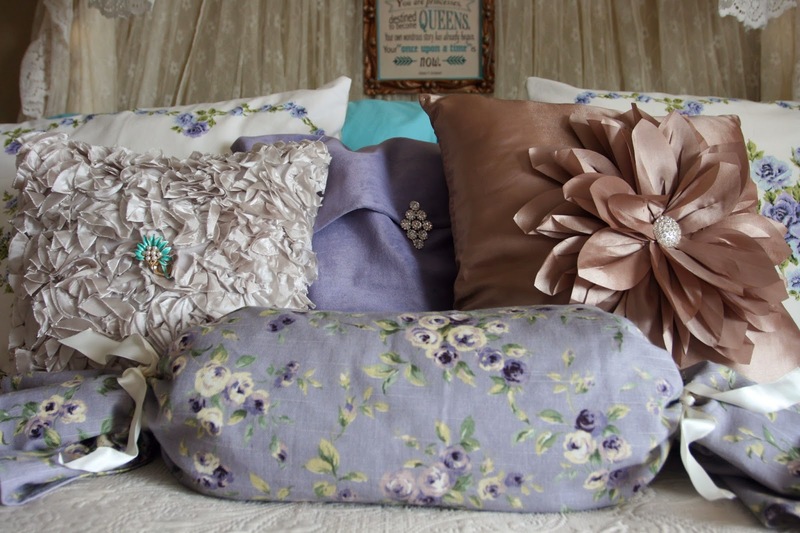 Close up of the pillows…the darker one was just about the only thing I bought at regular retail for the room. The lighter one I bought thrifting and added a vintage aqua brooch to it. The others I made…no sew! 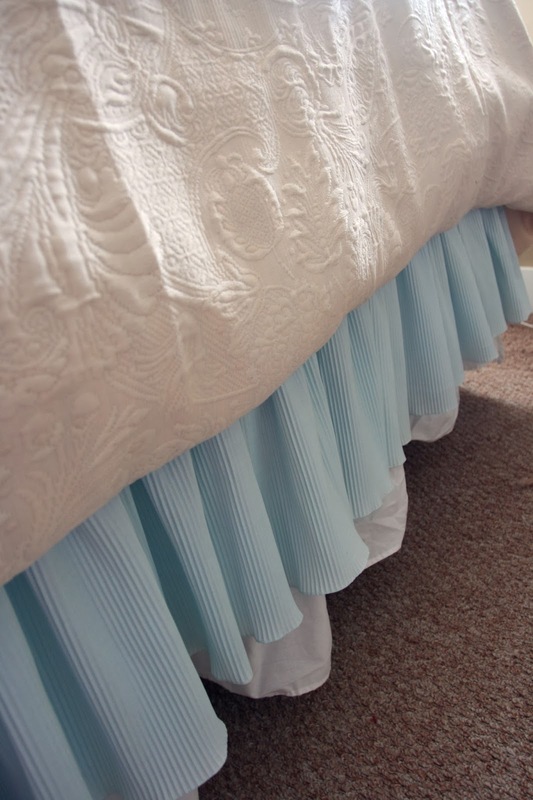 I got really lucky that an older bedskirt I had for years matched the room and fit the bed. The comforter used to be a coverlet style, and though I loved the fabric I didn't love the style. So I had my mom make it into a duvet cover for me with some additional fabric for the backside. 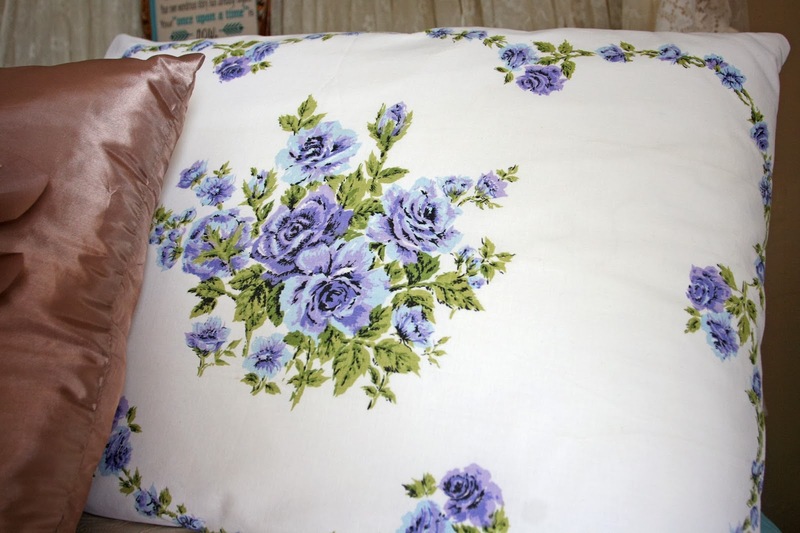 I even have shams that match it, and I love the elegant damask pattern. I got this FREE printable from HERE. It's one of my favorites quotes, but I didn't even find it until the day before when I was looking for something else on line. I couldn't believe it…it totally matched the room in color and in theme! I painted the frame I already had to match and hung it right over her headboard. 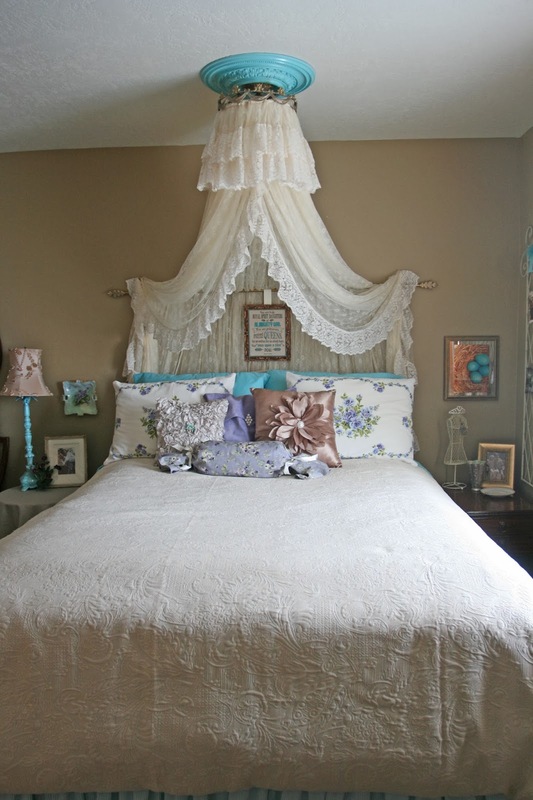 The plate hanging on the wall is one I've had for many years, and along with the vintage pillow case, was the color inspiration for the room. 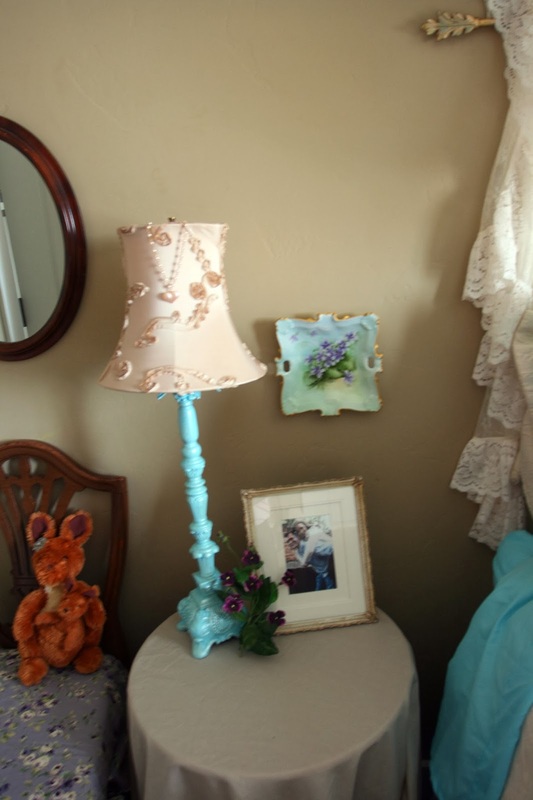 I found the lamp at a thrift store, shade included, and painted it to match (see next photo). 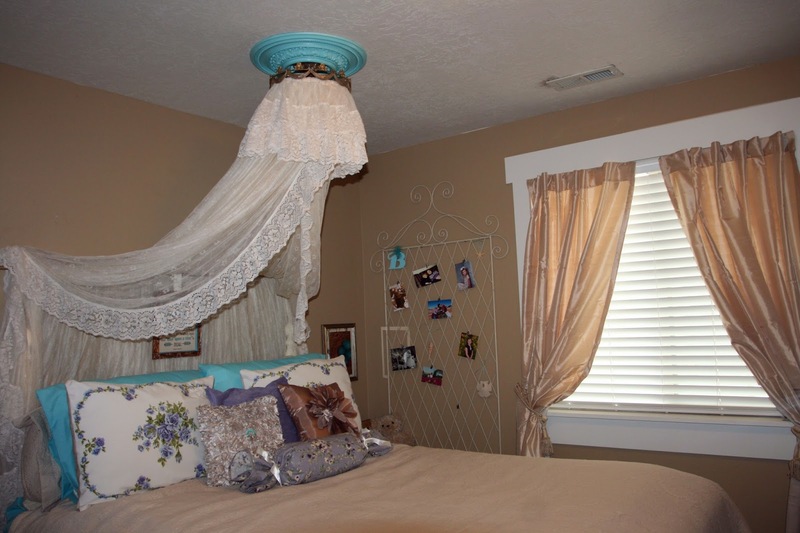 The lamp shade was the inspiration for the third color of the room…Champagne Gold. 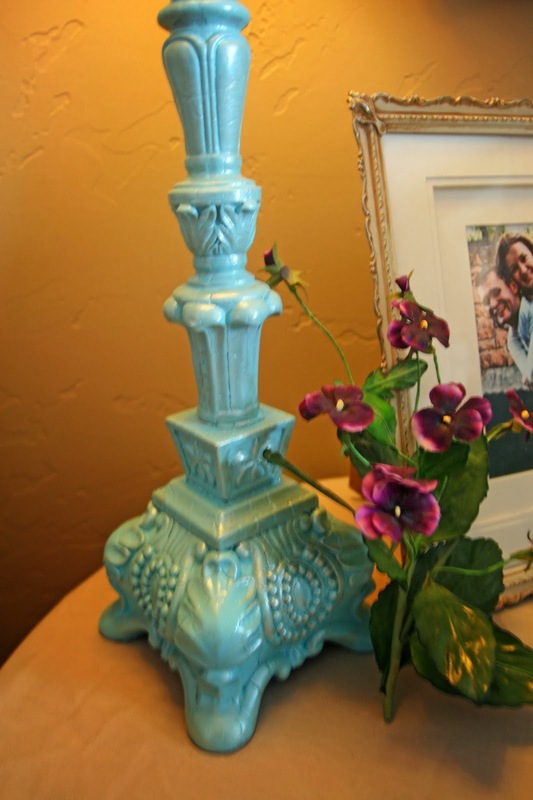 The lamp base was previously just a stone color. I used a glossy spray paint, and then dry-brushed over a pearly champagne colored paint to highlight the shape and the details. The other bedside table with some of her trinkets and a vintage plate I had to hold her earrings or bobby pins at night. This trellis was just hanging around….It never went outside because it didn't have feet. 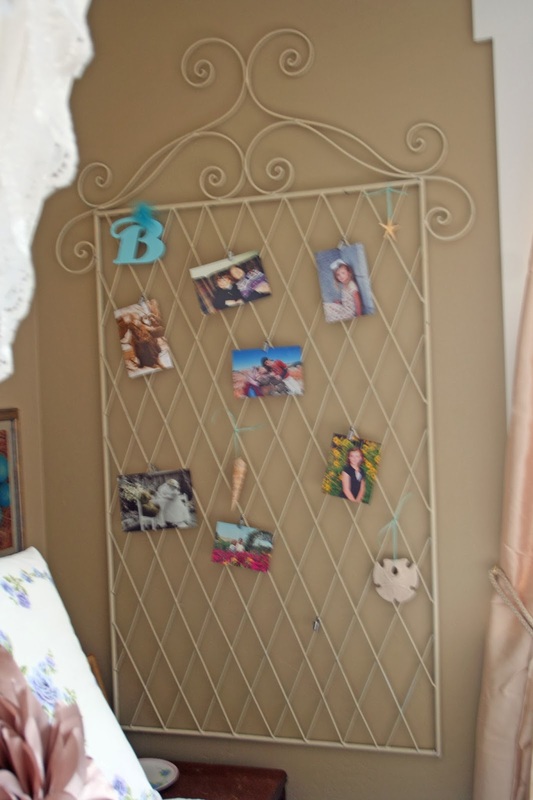 It ended up being the perfect memorabilia holder for her room with simple clips from IKEA attached to it. She can change it up anytime! 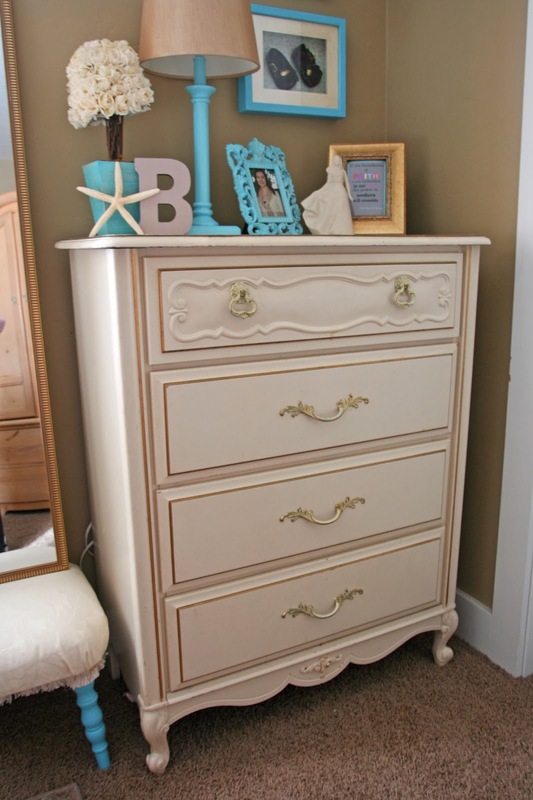 A dresser that I found the week before the room reveal online….for a really great price. And the handles were even champagne finished! MEANT TO BE! 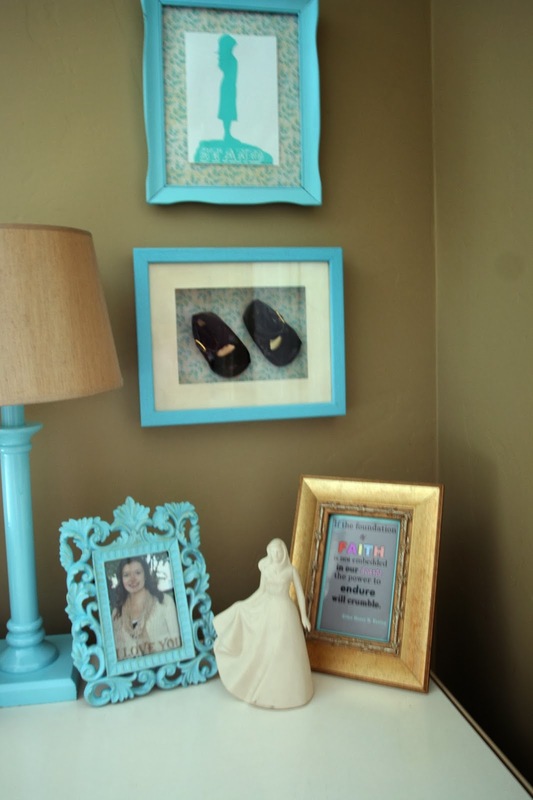 Her baby shoes in a shadow box along with some reminders that she is a Daughter of God. 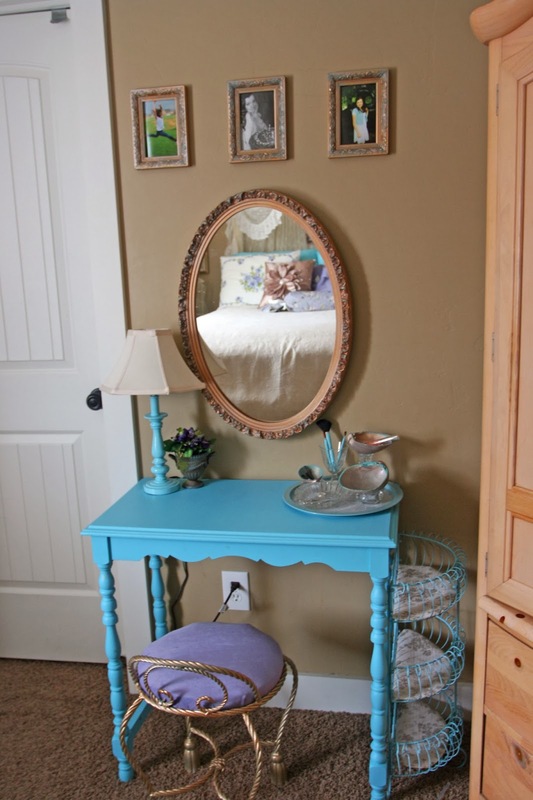 And this is the vanity/desk that I painted for her. I'd been using this little table on a landing, but it was absolutely the right size and cute shape for her room, so I did some re-arranging. I painted this dresser with Chalk Paint that I made myself, and I was so thrilled with the result that I'm using the same technique on numerous other pieces of furniture in my house! The table didn't have drawers, so I painted an old wire basket to match, and lined it with shelf liner so things stay put inside. This vanity stool used to be my grandmas. I love the connection between the generations that this chair now holds for me. I used to sit and watch my grandma put on her makeup while she sat in this chair, and now I get to watch my own daughter do the same thing. I love it. 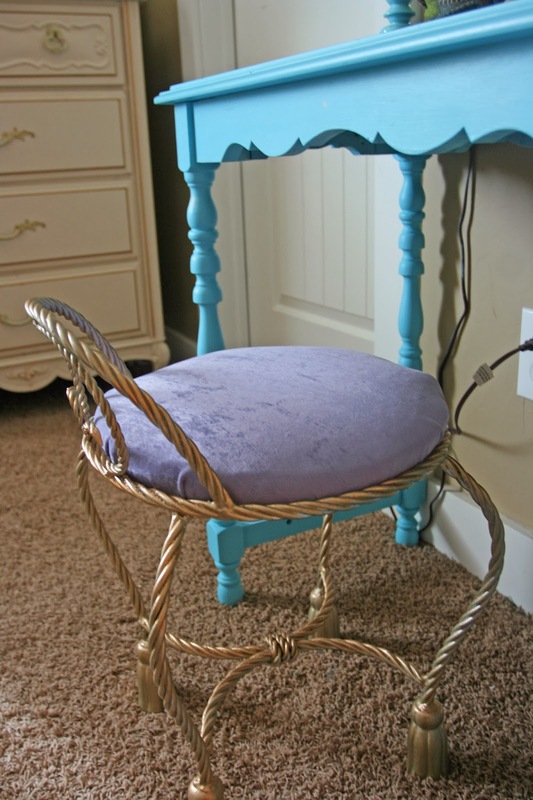 I simply added a new purple fabric to the seat to match the room. When I was searching through my seashell collection for elements to add to the room, I came across these larger clam shells and decided that I needed to use them somehow. An hour later, some paint and some cheap candlestick holders attached with E-6000, and I had some unique and original make-up and bobby pin holders for her vanity! I love them! 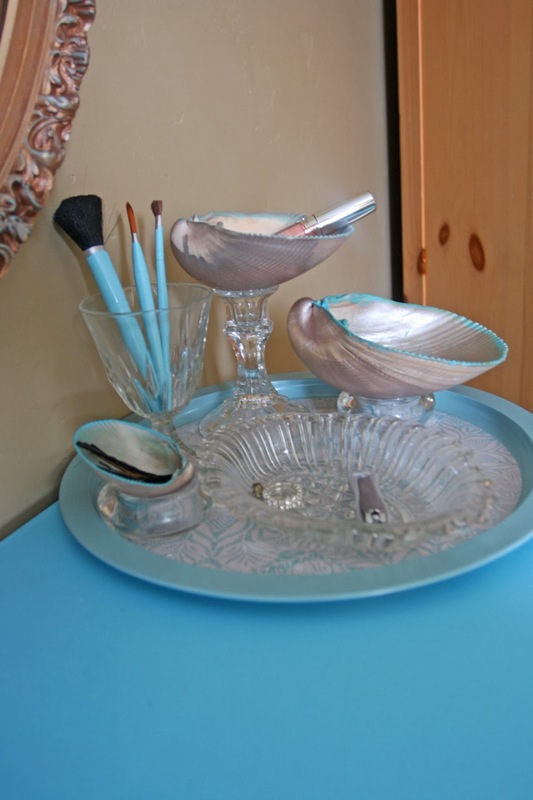 I added a couple of crystal dishes that I already had and put everything on a tray that I found on Christmas clearance from Joanne's. One of a kind…that's my style! 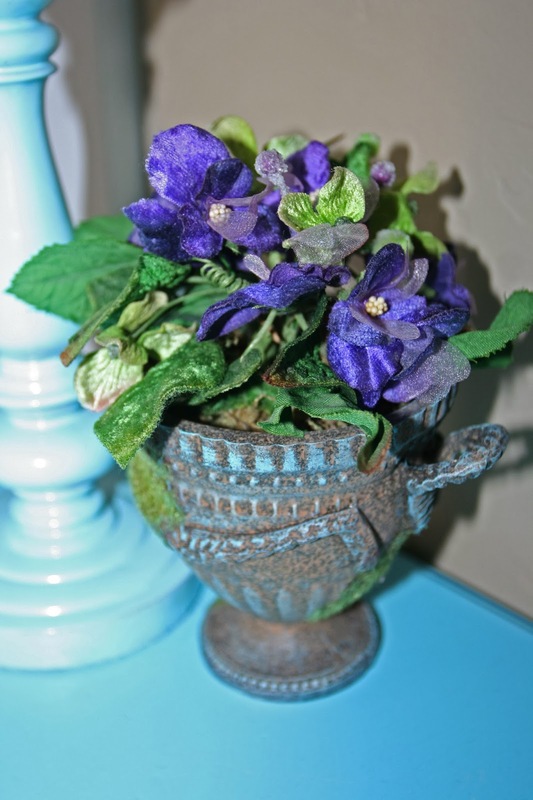 Cute little flower decoration that I already had…I just dry brushed on some aqua paint to give it a verdigris look. 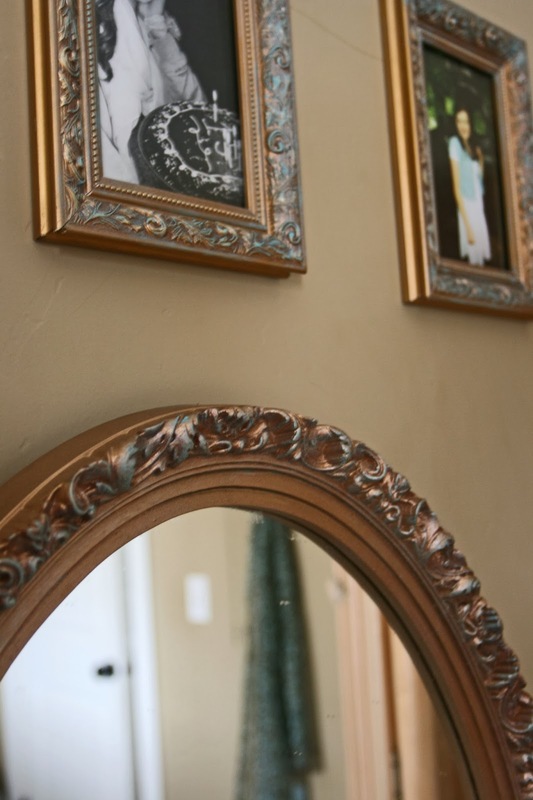 I painted the mirror frame and picture frames to match the room by dry-brushing them. 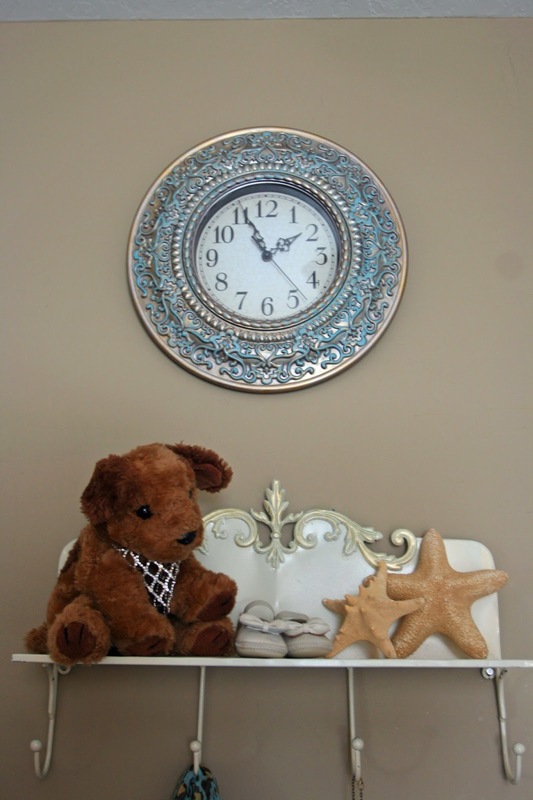 The clock started it's life as a cheap-o black and fake copper finish number from Walmart. Only $7.00. A coat of champagne spray paint and some aqua dry brushing made it look like it's a Verdigris finish! The shelf was purchased from a garage sale and was previously black. I dry brushed on the champagne color after I spray painted it. So there you have it! My budget Princess room for my Beautiful 16 year old daughter! I love how it turned out and I'm looking forward to finishing up some other projects with the chalk paint technique! 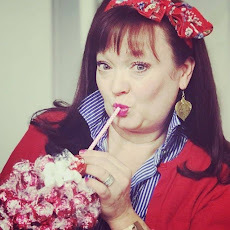 All Things Thursday Blog Hop! Very pretty! I love what you've done with the medallion for the canopy, very attractive!! 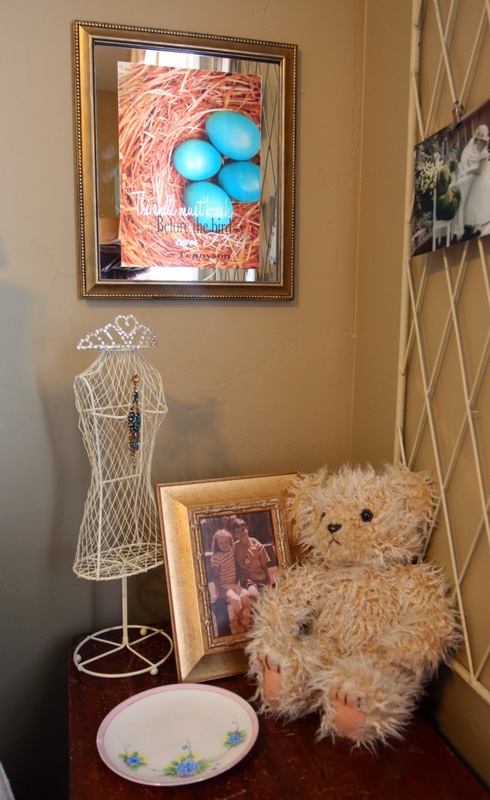 Your daughter's room is so gorgeous! I'm going to share the pictures with my 16 year old. How did she react? I wish I saw a picture of the lamp to see how you made it. Thanks Katharine and Fontini! Katharine, she was VERY surprised when she walked in that day! The lamp was super easy to do...just spray paint and then some dry brushing over the top with some metallic paint! I saw your post on Bloglovin and made a comment there. I would love to know the color and brand of the beautiful blue glossy spray paint you mentioned and also, the gorgeous pearly champagne color----love, love, love!!! Thanks Debbie J! I responded to a post by a Debbie on Hometalk and I think that was you, but just in case it wasn't, I'll share it here as well! 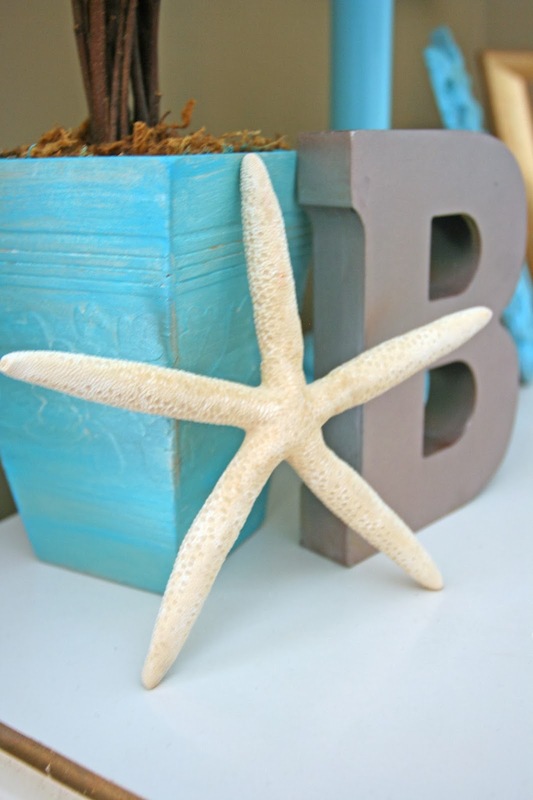 The Aqua paint is "Krylon Color master (paint+primer) in BLUE OCEAN BREEZE-Glossy". I can't tell you how MANY things in my house have been painted with that color. I might seriously be obsessed. And I got terribly lucky by finding a can of mis-tint paint at Walmart, that I made my chalk board paint with for the table, that was the EXACT shade of the spray paint. The Aqua Godesses were smiling on me that day! Now for the champagne, I can't give you an exact match because it was a can I'd had in my SP stash for years, and I used it all on this project so the can is gone...but I'm certain it was too old to match anyway. I'd just look for something in the metallics that is that hue. BUT, for the dry brushing, I used the DecoArt Metallics acrylic paint, and that is still available at craft stores. Emily, this is just darling! I bet your daughter loves it. Aqua is one of my favorite colors as well. 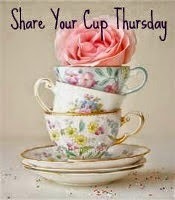 Thanks so much for sharing it with Share Your Cup. I'm sure it's not intentional, but I don't see a link back to the party. Jann, I'm sorry I thought I added it! I did on the Planted bike one...did I like THAT one on the party? geez...I'm losing it! Adding the back link now!